For those who celebrate Christmas, the holiday can generate gifting anxiety of the highest order. Some friends and family prefer giving to charities, and I'm all for that. But sometimes you might also like to give a hug of a gift. Magazines group items by recipient ("For Mom", "For the Girlie Girl") or by price. Ever notice how the "Under $25" category looks sad once you've perused the $500 selections? Below, ideas for adult friends and family, not by category, but by attitude: offbeat, unlikely to be duplicated and definitely not a regift. Each was also chosen for extraordinary value. Monica Tuent Pearls and Flowers Necklace, $56 (plus shipping). Monica collects vintage charms and beads, and creates charming pieces from her stash. There's something quirky, Spanish and personal in each. Su percute, supercozy, shown in Chocolate, also available in Carnation, Pale Aqua and Natural. Who wouldn't snuggle up to these? The arom atic juniper smells delightful, the knife is the perfect size for the pocket, picnic basket or kitchen "stuff" drawer. Elegant house gift or guy-treasure. A card arrives for Christmas, the fruit is delivered in January, when bleak winter (where I live) feels interminable. Then the cheerful, meaty, healthy Honeybells ("The World's Only Limited-Edition Fruit") arrive! One of the most-appreciated gifts we have ever given. Many other formats available on the site. Delight the woman who has everything, or the one who just adores diamonds. Micro-set diamonds (.50 ct tw) in 14k gold, 18-inch chain included. The center stone is surrounded by a star of 40 round cut diamonds set in 14 karat white gold. 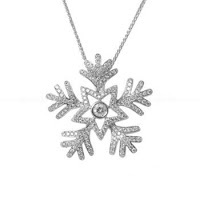 The snowflake has five branches that contain 25 round-cut diamonds per branch. The pendant size is .875 x .875 in. That's a lot of wintry sparkle! Hey there, big daddy. When a fella needs to be cool, he will be. 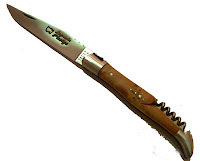 In black and brown, sizes up to 2X. Love the necklace, so unique! For fruit lovers may I also suggest Harry and David Royal Riviera pears (around $35 + shipping). These pears will knock your socks off. We usually get my MIL a gift in addition to the contributions to her charities, so I'm already on the prowl for that. I already know what I'm getting my husband (a messenger-style man bag, which he's actually made noises about wanting) and I send See's to my mom. Earlier this year I bought my dad and step-mom a gorgeous coffee table book with pictures of beautiful stables at Hermès (they're serious horse people). Pseu: You choices receive my Duchesse Delight Award, because each is chosen to honour the taste and interest of the recipient. Why thank you; that's high praise indeed! Seasonal jewelry is an interesting concept...but I think I'll pass. It's hard to imagine someone wearing a snowflake in the summer. Wendy: That's the point, they are meant to be worn in season. I want the fuzzy flip flops. I usually love Christmas. I love just gazing at the Christmas tree at night.